Hillsboro city workers are shown pouring concrete for a street light this week at the future “green space” on Governor Trimble Place. Shown is an artist’s rendering of the Governor Trimble Place green space. Safety and Service Director Mel McKenzie said there will also be planted trees in the grass areas and tables and chairs in the paver areas. Work resumed this week on a “green space” plaza on Governor Trimble Place in Hillsboro, and the project is expected to be complete in the third week of October, according to city officials. The project was stalled in recent weeks as workers waited for shipments of decorative brick, and Hillsboro Safety and Service Director Mel McKenzie said work has been slow going because city workers are completing the project as they are able. 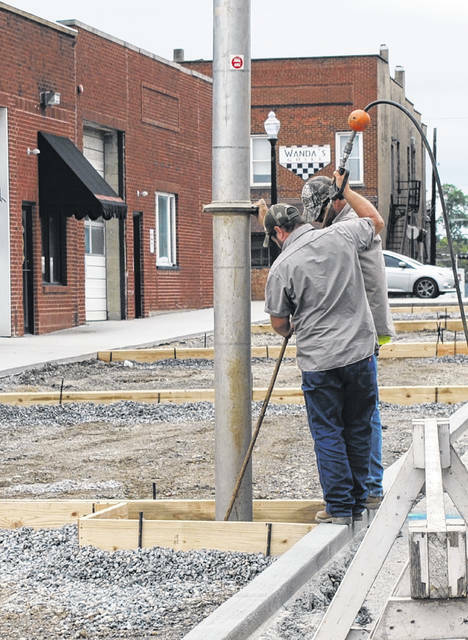 The project has seen a number of delays, including uncooperative weather and other projects being completed in the area, namely the demolition of a two-story building adjacent to The Times-Gazette offices and roof replacement on the Highland County Courthouse across the street. Crews were out and about on Governor Trimble on Wednesday installing wood frames to pour concrete bases for street lights and prepping different areas for brick pavers. An artist’s rendering of the green space shows a modular design to the plaza, with three square areas covered in brick pavers and three squares covered in grass. McKenzie said the completed green space will resemble the rendering, although there will also be trees planted in the grassy areas and tables and chairs in the areas where pavers cover the ground. The green space will also feature decorative planters. According to McKenzie, when the street reopens, it will be a one-way thoroughfare allowing only eastbound traffic. Parking spaces will remain the same, he said.